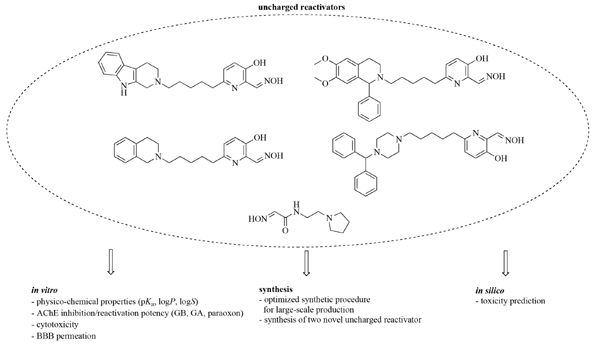 In vitro and in silico Evaluation of Non-Quaternary Reactivators of AChE as Antidotes of Organophosphorus Poisoning - a New Hope or a Blind Alley? Background: In the last decade, the concept of uncharged reactivators potentially able to penetrate the CNS has been introduced as an alternative to the classic charged oxime reactivators. However, this concept brings with it several associated drawbacks such as higher lipophilicity, difficulty in administration, lower affinity to cholinesterases, and higher toxicity risk. Objective: In this study, we compare data obtained for a set of five classic charged reactivators and a set of three recently published uncharged oximes supplemented by two novel ones. Methods: This time, we used only in silico prediction and in vitro approaches. Results: Our data showed that tested uncharged oximes have low affinity for cholinesterases, do not possess high reactivation potency, and certainly represent a greater toxicity risk due to higher lipophilicity. We assume that balanced physicochemical properties will be required for the successful treatment of OP poisoning. Nevertheless, the compound meeting such criteria and pinpointed in silico (K1280) failed in this particular case. Conclusion: From the presented data, it seems that the concept of uncharged reactivators will have to be modified, at least to improve the bioavailability and to satisfy requirements for in vivo administration. Keywords: Anxiety, acetylcholinesterase, organophosphate, oxime reactivators, quaternary oximes, non-quaternary oximes, neurotransmission. Title:In vitro and in silico Evaluation of Non-Quaternary Reactivators of AChE as Antidotes of Organophosphorus Poisoning - a New Hope or a Blind Alley? Keywords:Anxiety, acetylcholinesterase, organophosphate, oxime reactivators, quaternary oximes, non-quaternary oximes, neurotransmission. Abstract:Background: In the last decade, the concept of uncharged reactivators potentially able to penetrate the CNS has been introduced as an alternative to the classic charged oxime reactivators. However, this concept brings with it several associated drawbacks such as higher lipophilicity, difficulty in administration, lower affinity to cholinesterases, and higher toxicity risk.